Invasion of any organism or virus inside our body causes infection, leading to diseases.Any organism or virus that causes a disease is called a pathogen. 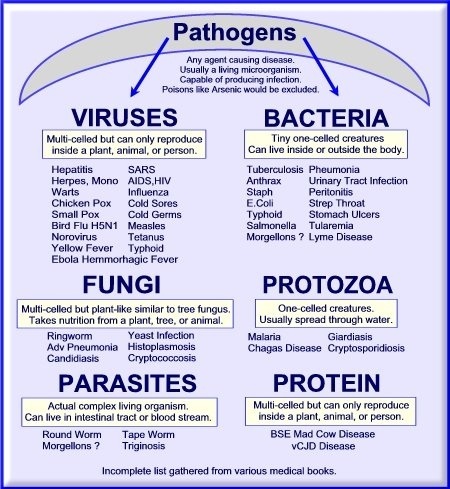 All pathogens are not microorganisms. Pathogens can be- bacteria, fungi, viruses, Protozoan, flatworms and roundworms. 6.3.2. Explain why antibiotics are effective against bacteria and not virus. 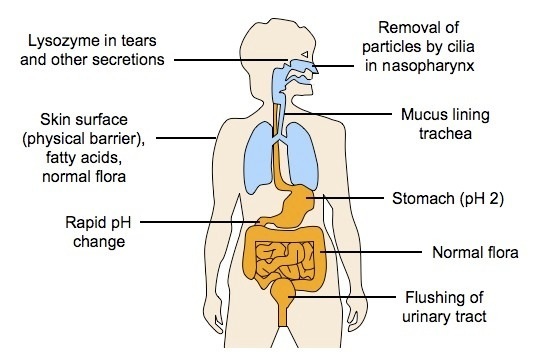 Bacteria can enter through various ports of entry in our body. They are capable of dividing every 20 mins under favourable conditions. They can cause various diseases in our body. Bacteria are prokaryotic. Thus there is difference in the biochemical reactions between the bacterial cell and the eukaryotic cell.Example- the protein synthesis is not exactly same, bacterial cells have a cell wall that is not a characteristic of our body cells. Antibiotics are chemicals that take advantage of these differences. Antibiotics are of different categories some may block the protein synthesis whereas others may inhibit the cell wall synthesis. Antibiotics can be bactericidal (kill the bacteria) or bacteriostatic (making them inactive). Viruses make use of our body cells' metabolism to create new viruses. Thus any chemical that could inhibit this would also be damaging our own body cells. Antibiotics are chemicals that can kill or damage prokaryotic cells but not damage the eukaryotic cells. group1- (pathogens) will find out the various ways they can enter and cause a disease in the human body. group 2- (immune system) Find out the barriers in the body that can prevent the entry of pathogens and protect against diseases. 6.3.3. 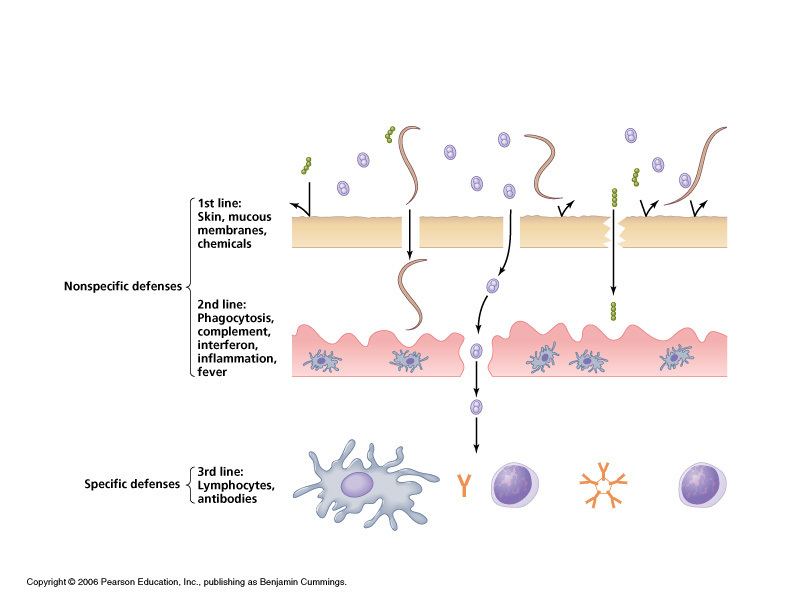 Outline the role of skin and mucous membranes in defence against pathogens. Skin is a physical barrier against infection. It is impermeable, having two primary layers.The outer epidermal layer of the skin is constantly being replaced and removes parasites and other pathogens. Skin has an acidic pH which inhibits growth of (pathogenic) bacteria). Lysozyme in the sweat prevents bacterial growth. Any kind of cut or aberration in the skin gives a chance for the pathogens to enter. Mucous membranes secrete a lining of sticky mucus that trap microorganisms. Mucus membranes also secrete lysozyme that destroys bacteria. Mucus membranes have ciliated cells, these cilia push mucus containing bacteria out. 6.3.4. Outline how phagocytic leucocytes ingest pathogens in the blood and body tissues. When a pathogen enters the body another line of defence is the white blood cells. There are different types of white blood cells that help our body in protecting from diseases. The main type of WBC that help in fighting a pathogen is called a macrophage. These macrophages can change their shape and ingest the pathogen. This process is called phagocytosis. These cells are capable of squeezing out of the capillaries to encounter any invader. The macrophage also recognises if the cell is a part of the body or not part of the body. This is recognition of self and non-self is based on the protein molecules that make up the surface of all cells. If the macrophage recognises the invader as non-self it engulfs and digests it. They have lysosomes that contain enzymes for this digestion. Since the identity of the pathogen is not determined at this stage, this type of response is called as non-specific mechanism. A pathogen is made up of cells with cell membranes or a protein coat in case of virus. The pathogens have proteins embedded on their outer surface. The immune cells recognise these as antigens. Protein molecules produced in response to these antigens by our body are called as antibodies. Each pathogen triggers an immune response and produces antibodies. For example- If a virus enters then the body will stimulate production of one type of antibody and if a virus enters then the body produces another type of antibody. However all antibodies have a similar structure, a protein that is Y shaped. at the end of the fork of the Y there are binding sites. these bind with specific markers on the pathogen. Antibodies are produced by lymphocytes called the B- lymphocytes. Antigens are foreign substances/pathogens that stimulate antibody production. The antigens on the pathogens are recognized by antibody of a particular lymphocyte. Humans have many types of lymphocytes of which one type can recognize a particular antigen. 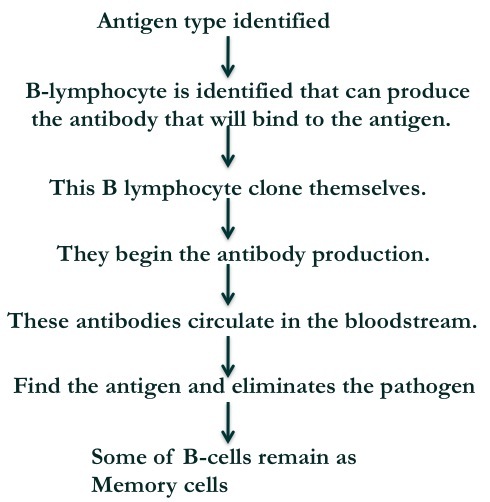 When a particular type of antigen is recognized it activates the B-lymphocytes. The activated lymphocyte divides many times producing a clone of lymphocytes. These lymphocytes start secreting antibodies. Antibodies are special proteins that encounter the pathogen and eliminate it. Some of the B cells remain as memory cells. These help in fighting the infection a second time. 6.3.7. Outline the effects of HIV on the immune system. HIV results in a set of symptoms called acquired immune deficiency syndrome (AIDS). Viruses attack cells in the body that matches its own protein. HIV also attacks a cell that has its own type of protein. It has a similar protein with the T helper cells circulating in the blood stream. The helper T cells are the communicator cells in the bloodstream. HIV has a latency period hence remains undetected after infection for many years, till the symptoms called AIDS develop. The helper T cells are the cells that communicate which cells need to undergo the cloning process and begin the antibody production. When the helper T cells die, there is no communication for antibody production. The individual is thus not able to fight off the pathogens and the symptoms of AIDS appear. Thus it is this one or more secondary infection that takes the life of some one with AIDS. AIDS is caused by a virus- HIV. It penetrates (T) lymphocytes. It is a retrovirus with reverse transcriptase enables DNA to be produced from viral RNA. The number of lymphocytes reduces over years. This results in lower immunity and thus other illnesses develop. AIDS is the observed syndrome when final stages of infection develop. HIV is transmitted through blood/sexual contact/body fluids/placenta/childbirth/ breastfeeding. The transmission is uneven around the world; transmission risk increases depending on society’s traditions/beliefs/behavior. Rare minorities of individuals do not have cell receptors and do not develop AIDS. However, condoms/latex or barriers only provide protection against transmission through sexual contact. The treatment is expensive everyone cannot afford it. Reusing unsterile syringe needles for during legal or illegal injections and blood transfusions without testing leads to spread of AIDS. AIDS pateints are discriminated interms of employment, insurance, education, social acceptance etc. Most countries do not have the education and medical facilities to deal with the disease. Inadequate medical care leads to increase infection rates as patients with variety of diseases are grouped together in large “wards”.